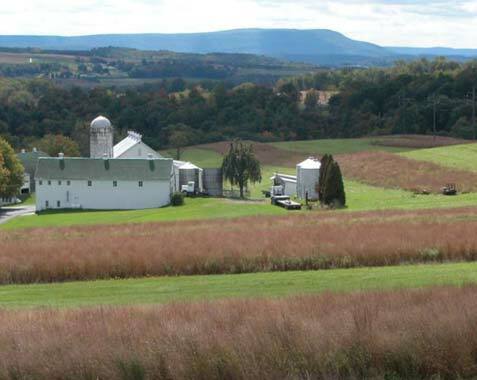 The focus of the program has been on the potential use of marginal croplands for biofuel production conducting research at multiple scales on the ecology and management of grasslands, developing sustainable bioenergy production systems including investigation of suitable biomass crops for the northeastern US, and life cycle assessment of a range of bioenergy crop production systems, including net greenhouse gas emissions, energy balance, and the impact of climate change. Marginal croplands, such as those in the Conservation Reserve Program (CRP), have been suggested as a source of biomass for biofuel production. However, little is known about the composition of plant species on these conservation grasslands or their potential for ethanol production. We surveyed 34 conservation grasslands located over the major ecological regions of the northeastern USA during late August through midOctober and measured aboveground biomass, plant chemical composition, and potential ethanol yield. There was a large range of biomass yield (0.5 to 12.9 averaging 6.6 Mg/ha) and potential ethanol yield (200 to almost 5800 L/ha) in this survey of the conservation grasslands in the northeastern USA. Conservation grasslands with greater cover of tall C4 prairie grasses had higher aboveground biomass, lower total plant species numbers, higher ethanol yield per unit biomass, and consequently a higher ethanol yield per unit area. Management to increase the cover of tall C4 prairie grasses on low productivity sites may be necessary to upgrade these sites to profitability. These tall C4 prairie grasses are highly competitive. Because of their higher nutrient use efficiency compared with the many other plants on these sites which were C3 species, more biomass could be produced with less inputs. Some of the other species, however, were C3 legumes, with the potential to increase site productivity. The season when switchgrass is harvested affects biomass yield and quality to make biofuels like ethanol and feedstock for thermochemical conversion, such as pelleted fuel. 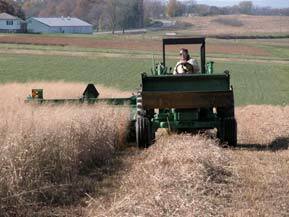 Annual summer and spring (delayed from fall) switchgrass harvested yields were 22-30% lower than fall, with summer yield reductions due to reduced persistence and spring from increased residue remaining on the ground. Biennial and triennial harvested yields were 66-80% higher than summer annual, but less than 35% greater for fall and spring. Total aboveground biomass was 112-151% greater for biennial and triennial harvest than summer annual. With improved harvesting methods, residue biomass could be decreased improving harvested yields and the viability of spring and reduced harvest frequencies. Yield of switchgrass harvested annually in the summer reached peak biomass after August 1 the first year, but decreased in succeeding years, stabilizing at yields similar to mid-July harvests. summer (> 1% N, highest in other elements, \< 18% water content), fall (0.5% N, other elements lower, > 25% water content, however, if fall mowed and baling is delayed, water content may drop below 18% for stable storage), spring (0.5% N, other elements lowest compared with other seasons, typically \< 10% water content). Bioenergy crops offset greenhouse-gas emissions in 3 key ways: by removing CO2 from the air and storing it in crop roots and soil as organic C; by producing co-products, for example lignin burned in the biorefinery produces energy in excess to that needed to make celllulosic ethanol; and by displacement, whereby replacing a fossil fuel with a biobased one “recycles” rather than adds more CO2 to the atmosphere. Compared with the life cycle of gasoline and diesel, ethanol and biodiesel from corn-soybean rotations, which included 50% stover harvest, reduced GHG emissions by about 40%. This reduction was about 2 times greater than using ethanol produced from corn grain alone. However, using switchgrass and hybrid poplar would produce nearly a 3-fold greater reduction in GHG emissions compared to corn-soybean rotations.